Forecaster: Threat 'Growing.' Could Hurricane Impact Hellertown?Saucon Source	Forecaster: Threat 'Growing.' Could Hurricane Impact Hellertown? Threat ‘Growing,’ Forecasters Say. Could Hurricane Impact Hellertown? The threat of a major hurricane affecting parts of the East Coast including possibly Pennsylvania and New Jersey by next weekend is growing, according to meteorologists. 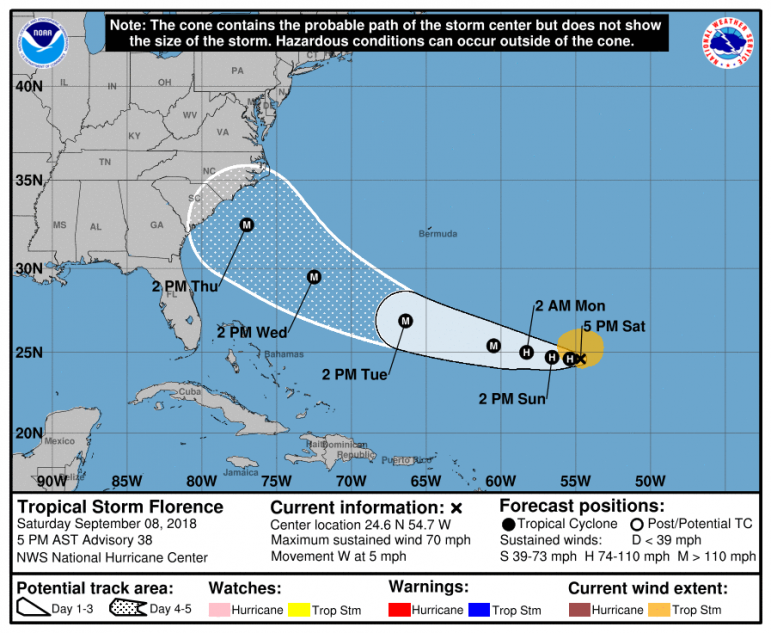 In a hazardous weather outlook issued Saturday afternoon, the National Weather Service stated that the latest forecast track from the National Hurricane Center brings Florence into the western mid-Atlantic area by Wednesday night. “That said, the risk for impacts along the East Coast has increased,” the NWS said. “Continue to monitor the forecasts from the NHC on the track of Florence and begin thinking of possible preparations in case our area does have an impact from the storm,” they advised. This NOAA forecast map shows a ‘cone of possibility’ for Hurricane Florence for the next five days. Pennsylvania Weather Action on Saturday published an post about the increasing threat of impacts from Florence, from the Carolinas on up the coast to the Mid-Atlantic. According to Corrigan, if Hurricane Florence is east of North Carolina on Friday morning the two likely tracks are either west or north, with either track having the potential to bring devastation and destruction to the areas within the storm’s path. Any heavy rain that falls due to a hurricane making landfall somewhere in the Mid-Atlantic region could cause extensive flooding, as the remnants of Hurricane Gordon are forecast to soak much of the region with inches of rain over the next several days. The least likely scenario at this time, Corrigan said, is that the storm will make a U-turn and head back out to sea. Former Hellertown Psychic Reading Store: What Should Go There?